Successfully Added Zopo Speed 7 Plus Android 5.1 Smartphone - 4G Connectivity, 5.5 Inch, Octa Core CPU, 3GB RAM, 16GB Memory, 13MP Camera (White) to your Shopping Cart. Zopo have a new flagship phone and its called the Speed 7 Plus, as you would expect from a phone with speed in the name this cell phone is super fast. Coming with some eye catching specs the Zopo Speed 7 Plus 4G Smartphone offer the best bang for your buck if you want a phone under $250. 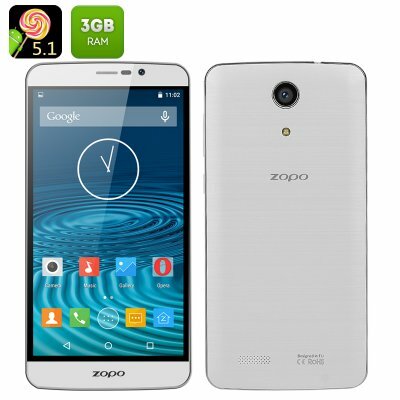 For starters the Zopo Speed 7 Plus boats a 5.5 inch 1920x1080 IPS display that puts it firmly in the Phablet category. This screen offers 400 pixels per inch ensuring that everything you view on it be shown in vibrant quality with beautiful detail. Along with the stellar display you get a lightning fast MTK6753 64bit octa core CPU and a massive 3GB of RAM for an impressive performance that can run games and multitask without lag or overheating and is sure to impress. Two micro SIM card slots each provide 2G, 3G and the latest 4G network covering a wide range of bandwidths. This makes it possible to stream movies and rich content directly to the devices and quickly backup or retrieve online data. Each SIM card remain active with dual standby so managing contacts on different sim cards and keeping track of personal and business contacts is easily achieved. With Android 5.1 out of the box you can get going on the latest advances that this OS offers and enjoy a seamless user experience as you navigate between tasks. With a 3000mAh battery there’s enough power to last you thought the with up to 8 hours of continuous use or as much as 120 hours of standby time. Thie Zopo Speed 7 Plus Smartphone comes with a 12 months warranty on all our products. Brought to you by the leader in electronic devices as well as wholesale Android Phones, Chinavasion..